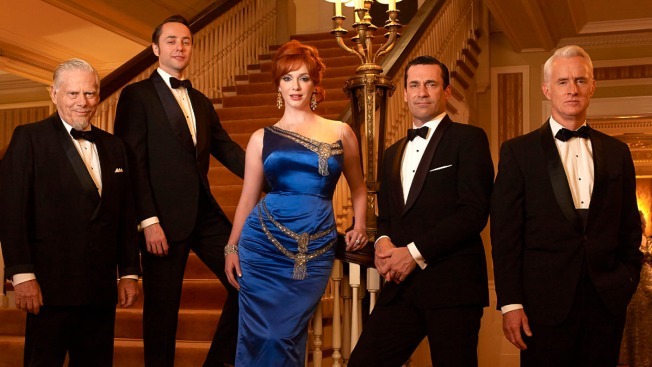 Bertram Cooper (Robert Morse), Pete Campbell (Vincent Kartheiser), Joan Harris (Christina Hendricks), Don Draper (Jon Hamm) and Roger Sterling (John Slattery) from "Mad Men." For one week this month New Yorkers can get a taste of Don Draper's world. "Mad Men Dining Week" is set for March 23-29. Thirty-four top New York City restaurants are participating. They'll offer 1960s-inspired lunches in celebration of the last season of the award-winning "Mad Men" television drama. AMC and the city's official tourism and marketing organization NYC & Company say the prix-fixe lunches will be $19.69. Diners will be able to choose from a two-course menu of appetizer and entree or entree and dessert. There's also a "liquid lunch" option: no food, unless you count the martini olive or the lemon twist. Participating restaurants include Delmonico's, P.J. Clarke's, "21" Club and Tavern on the Green. "Mad Men" kicks off its final seven episodes on April 5.